This blog post is a summary of our recent webinar “Digital disruption for Product Information Management” presented by Darren Cooper, Director of Industry Solutions, Stibo Systems. To get even more insight on this topic, hear the full webinar (30 minutes) on-demand, and for free, here. It’s no surprise that product information managers’ jobs are getting a little more complicated these days. Products, offerings and services are becoming more complex to design, sell and monitor. For companies who want to support digital disruptive products and services, Product Information Management (PIM) processes will need to evolve quite significantly. As a consequence of changing and more demanding consumer expectations, basic products may now be combined into solutions, and business partners might collaborate to enhance the value proposition of these solutions. Digital services might complement products to allow for more flexibility and better customisation, transforming traditional product business models into Product-as-a-Service business models. 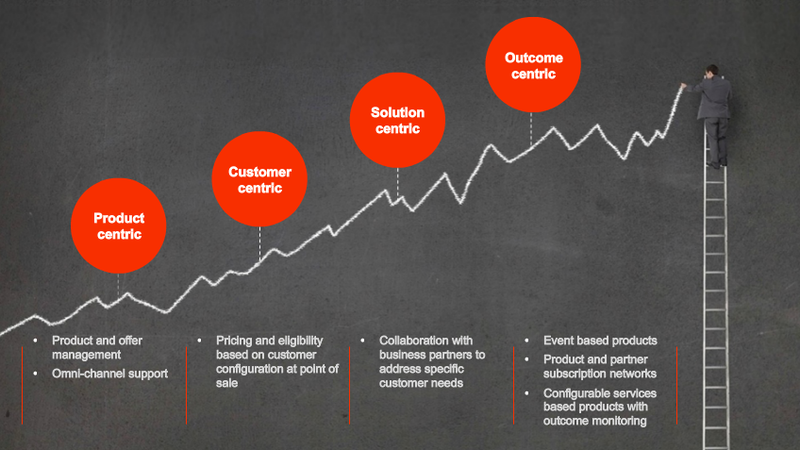 Many are now striving to offer solution-centric and even outcome-centric products and services. If you want to learn more about how manufacturers can manage the shift to Product-as-a-Service offerings, you might find this blog post interesting. What does this mean from a PIM perspective? Let’s take a traditional mass-produced, one-size-fits-all product. To grow adoption and profitability, businesses are turning to more targeted market segmentation and more sales channels. However, becoming customer-centric requires a bit more effort, and not just inclusion of customer data management. A customer-centric offer needs to be configured to the characteristics of the customers’ requirements, user experiences and user environments. So the challenge becomes how to define this configurability and manage this data coherently and consistently for all channels. As we move up the line from customer-centric to solution-centric and outcome-centric, we might be faced with many more new sources of information that all influence customer choice. To support the flexibility demanded by a digitally disruptive world, many more data points will need to be defined for any particular product. They will be both static – known as reference data - and dynamic – known as operational data. Consider the image below. 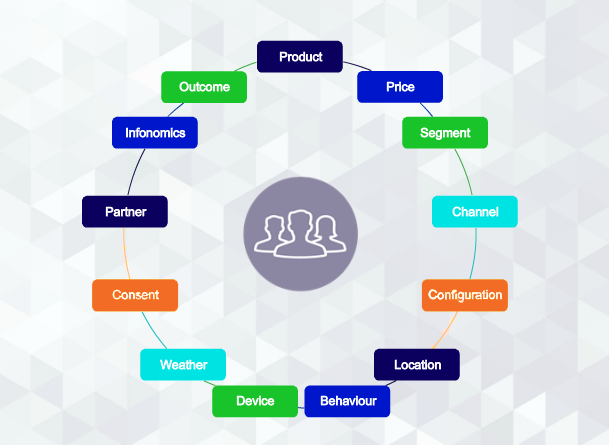 This represents the growing number and complexity of parameters that can determine what product you need. For example, the price might be different depending on the sales channel and the product might be different depending on where you intend to use it, etc. So what five key points should you consider from a PIM perspective in the development of digitally disruptive products and services? Product information configuration – commonly referred to as product personalisation - is no longer just a manufacturer concern, but also a distributor concern. How do you describe your product to accept the significant number of configuration options and how do you enforce the configuration rules when the product is being sold or even used? Sales teams are going to need better tools to help customers with the process of choice. Imagine a product with additional software and services over and above the basic configuration. The sales of such a product could be quite difficult to manage. Today, services are very much key differentiators. Product information Managers will need the skills and tools to define and distribute these services as well as strategies to manage complex arrangements of products and services. Instrumented products will be augmented with services that monitor and enhance product performance. For instance, your new tennis racket could come with a service that measures your performance and tells you how well (or badly) you’ve played. Digital services, and in particular IoT technology, are playing an ever increasing role in how we design and develop solution-centric products and services. Product information managers will need to merge descriptions of both the physical and the digital world in the same product development process. In the product and service business model, service support has high value proposition. Hence, manufacturers will need to create more remote management capabilities, not only for the management of the product but also to better understand the consumer and how they use the product. And as digital services are helping manufacturers become much more intimate with their consumers, they’ll have to manage more and more consumer information. The product information manager might want to consider how to integrate this new type of information as part of the product design process. One of the most successful ways of growing market-share is to embed or bundle a complementary product or service into an offering. The perceived value of the whole should be greater than the sum of its parts. Thus, the ability to recruit partners help add value to existing products and services is a key part of today’s product design tasks. But the collaboration should perhaps be made at the offer or product design stage and the information of the partner’s complementary services should then be on-boarded during the PIM lifecycle. This will require a more detailed understanding of the partner relationship, especially if the partner’s products or services are highly configurable and designed to only work in certain ways with the manufacturer’s product. Machines are already implementing and assisting the choices being made in products and services. They are over time becoming involved in more complex selection processes and are going to take on many new forms as well. Have you decided how to manage information that supports your product information integration to digital assistants, such as Amazon Echo? These voice powered devices are becoming popular, and brands are seeing this as an opportunity to interact directly with their customers. There are also product labelling aspects to consider: Does your product pass visual recognition test? And when you speak to the assistant does it not only find the product but relate it for the use case of which it was designed? As machines are increasingly influencing product choice, PIM becomes more complex with more variety, bigger volumes, more people and more processes to organise. All of that is going to drive the requirement for contextual information management. Persuasive technology is technology that influences a change in behaviour or attitude. A simple example is the Fitbit that, based on monitoring, encourages its users to for example walk more steps a day and sleep more hours at night. But lots of things can be called persuasive: If you’re selling a bag, it’s probably more persuasive to show the customer an image of it with things in it that he or she would normally carry in their bag. As products become more instrumented, and more digital services are created, we’ll need some level of authority or governance to define the usage of persuasive technology. In the future, PIM managers will indeed have to manage persuasive content and associated tools as part of the PIM design process. It’s very likely that PIM is going to become much more complex in the near future. The PIM manager 2.0 will most likely work with new types of information, for example customer information and media information, but also develop new skills to be able to manage different levels of services.